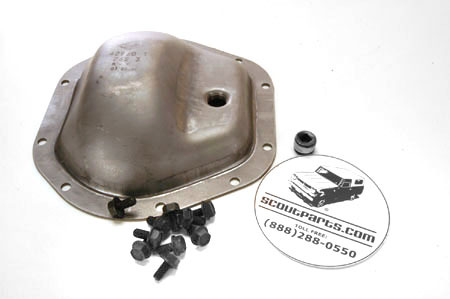 This is a brand new diff cover for the Dana-44 front and rear axles used by Scout 800 & Scout II, and Travelalls and pickups (K, KB, L, R, S, A, B, C, and D-series) made over the years. This may also fit M-series (Metro). This will also fit all Dana-44 axles used by Jeep, Ford, Chevy, Dodge, Willys, Checker, and many others. This is a new OEM Dana part. If yours is all bashed in by rocks like most of them are, then this is an easy upgrade. Kill those leaks, and make it look new again. This is the extra-thick cover that is so sought after due to its protection against rocks. Thicker than your old one, this comes with a new set of flanged locking bolts, and a new square-drive fill plug. Gasket is not included, but can be ordered separately as SP11952.